Version 2.0 is the biggest 1Chart upgrade to date! 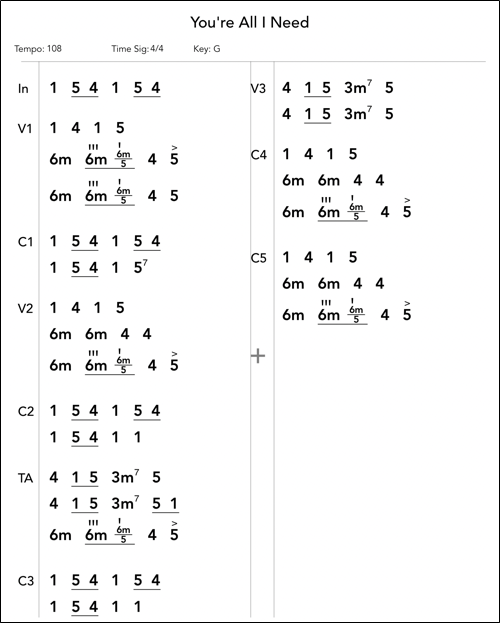 With this new version, we’re staying true to 1Chart’s Nashville Number roots, but also making the app accessible to anyone who would rather see chords in letter format. And that’s just the start. Read on to see how we’ve added much more functionality to make it easier than ever to create and share charts of your music. Em7 or 3m7? Now you can choose your preferred chord format in each chart you create, and toggle back and forth between numbers and letters at any time. 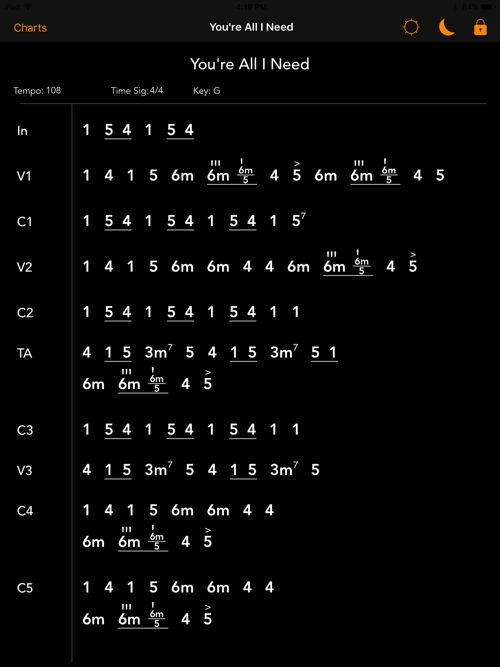 And when you change keys while in letter format, 1Chart updates chords throughout the chart to reflect the change. Modulations are handled with ease, as well. In 1Chart v2.0, when you first open a chart created in 1Chart v1.7 or earlier, the app will attempt to set the chart’s key using the existing freeform text in the Key field. If 1Chart isn’t able to decipher the existing text (for example, drummers have sometimes used this space for information other than the song’s key), it will set your chart to a default key of C and place the text in the subtitle so you still have it available. This new format can be helpful for fitting more content on a single page. You can choose this format when first creating a chart, or toggle back and forth between the 1- and 2-column formats at any time. Tap to enter the new Performance Mode, which locks your chart, preventing unintended edits. Once in Performance Mode, tap for Dark Mode and to prevent screen dimming (so your iPad won’t go to sleep while you’re performing). Need to quickly share a collection of your charts? Now you can export notebooks in either native 1Chart Notebook format (for easy, one-tap importing by another 1Chart user) or as a collection of PDFs or .1ch files in a .zip file. To export, tap next to any notebook name. To import a notebook in native 1Chart format, navigate to the Notebook Browser and tap . Tap , select “Send a Copy” and choose PDF format to print your chart to an AirPrint-compatible printer. Measure alignment (formerly known as “columns”) gives you the ability to align your measures vertically. Some users prefer this view because it gives an at-a-glance sense of the duration of each line. Choose “Align Measures Vertically” and you’ll now be able to align up to eight measures per line. You may need to select the smallest font size when using 6-8 measures per line, so your measures can fit within the space allotted. If you’ve selected Measure Alignment for your chart and have a measure with too much content to fit in the horizontal space allotted, you’ll now see an orange bar giving you a warning that the measure contains hidden content. You can tap the orange bar to see and modify the measure’s contents. In general, if you’re seeing the orange bar appear, you’ll want to switch to fewer measures per line to give each measure more width. Or you can switch to a freeform chart. 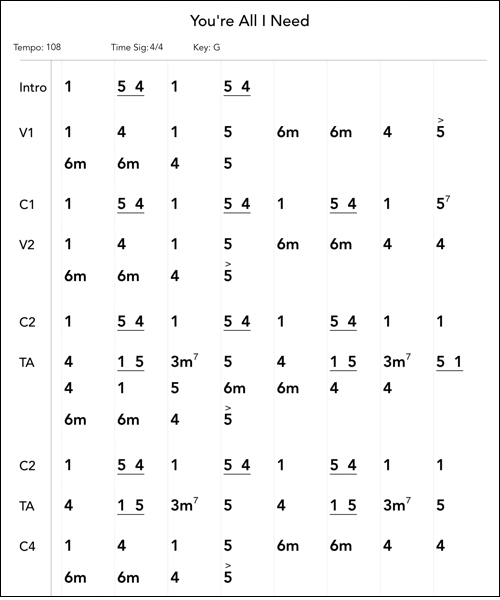 “New section,” “new line”, “end measure” and other keys are now available across all 1Chart keyboards. New baseline-aligned “Maj”, in addition to the superscript “Maj”. You can use the baseline version to emphasize major when you might expect minor, and the superscript option for a maj7, for example. New 16th “push” and “delay” characters. Like their 8th-note siblings, these indicate to play the chord early or late versus the first downbeat of the measure. That’s it for this version, but there’s more to come. Please join us in the Community to tell us how you’re using 1Chart and to share ideas for future versions. Thank you for using 1Chart!